Clip from Iran TV to YouTube by "FulcrumPilot"
It is matter of great national pride to see so many Persian Cats F14A upgraded and flying in such large numbers. IRIAF today is perhaps the sole and largest operator of upgraded F4E as well. 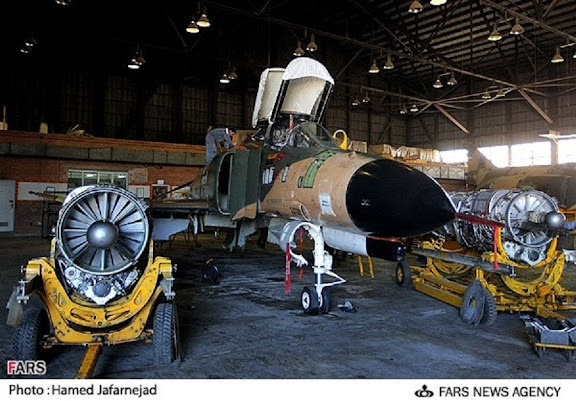 It is glowing testament to the ingenuity of Iranian engineers, Hamofars (technicians) and above all superb pilots who have mastered these complex jets without any spares or technical assistance from the US manufacturers since 1979. It is am immense national achievement indeed. This is very impressive...Even American doesn't have the technology to do this prior to 1940. Witty comment... if and when it comes to an open war Iran might aswell bury their air force in the sand. The regime would be commiting a crime if they forced the poor pilots to fly with all those odds against them. One shouldn't even think about contending the USAF for air supremacy, unless you have the latest toys and have been practising thoroughly for years as your opponent has done. I am sure they can be used bombing camels. That shows how advanced the Iranians have become. They can repair technology that the Americans did not have in 1940. Wow Yossarain, I did not know that America produced the GE J79 turbojet in 1940. Looks like you missed your medication again. BTW, even the Germans did not develop a basic kerosene based jet engine (fueled by distillates like JP4, JP8, Jet-A, Jet-B,etc.) for ME-262 till 1945 and a bit too late to win the war. On a more serious note, even most NATO airforces including the current German Luftwaffe could not completely rebuild the complex J79, with even full US manufacturer support and technical designs. IRIAF started from scratch in 1980 and was able to master the technical aspects as well as avionics of the F5, F4 and most importantly F-14A all by itself with trial and error and without any support or spares from the US manufacturers. Most Iranian innovation was done during the jange tahmili and under fire. It is a great achievement for Iran and its technical prowess. You may think that you are "witty" but more like a dimwit (or fwit) in reality. LOL. Anon 2:09 PM, you clearly have nothing worthwhile or relevant to say. Silly hasbara shill.